We have two new Warped figures thanks to two M.U.S.C.L.E. collectors. Bowls, history, Class A figures, and even a few Quik figures. This was a fun one to write. Chris was listing a large number of Nestle Quik M.U.S.C.L.E. figures on eBay. He also sent his pictures to be added to the Nestle Quik virtual archive. Two new warped figures, and two manufacturing error figures have been added to their respective visual archives. A complete visual archive of M.U.S.C.L.E. figure #221. 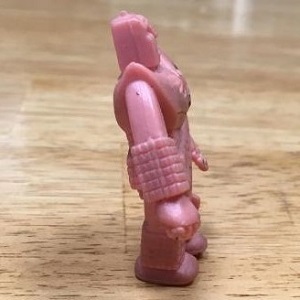 As the Figure #221 portion of the online version of the UofM M.U.S.C.L.E. Figure Guide was being built, an interesting discovery was made. One of the seven manufactured figures had an error, but does it offer insight or is it merely an anomaly?